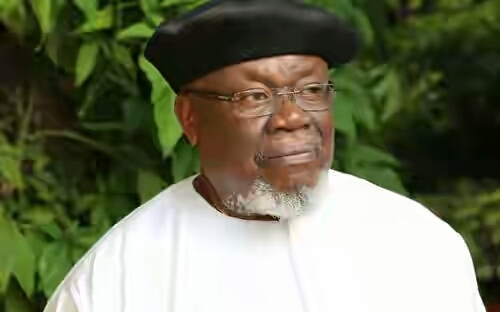 Former Minister of Foreign Affairs, Chief Tomi Ikimi, has disclosed why Governor Adams Oshiomhole won his 2012 re-election. He said Oshiomhole won his second term because former President Goodluck Jonathan provided a level playing field. Chief Ikimi disclosed that the party was set to drop Governor Oshiomhole after his first term but that Oshiomhole begged him to be given a second term ticket. Ikimi noted that Oshiomhole won the election with a landslide victory not because of his merit but because himself and Pastor Osagie Ize-Iyamu took him to former President Jonathan to demand for a level playing field. The former minister spoke in Benin City at the flagging-off of Pastor Ize-Iyamu governorship campaigns. Chief Ikimi boasted elections were won in the state with personalities like Chief Gabriel Igbinedion and Chief Tony Anenih. According to him, “Pastor Ize-Iyamu brought Oshiomhole to me. I never knew him before. I was told he was a former Labour leader. I was persuaded to accept him and we took him round the 192 wards. “In his first four years, he betrayed us. We wanted to drop him but he knelt down to beg me. It was myself and Pastor Ize-Iyamu that took Oshiomhole to former President Jonathan to beg him to provide a level playing field.